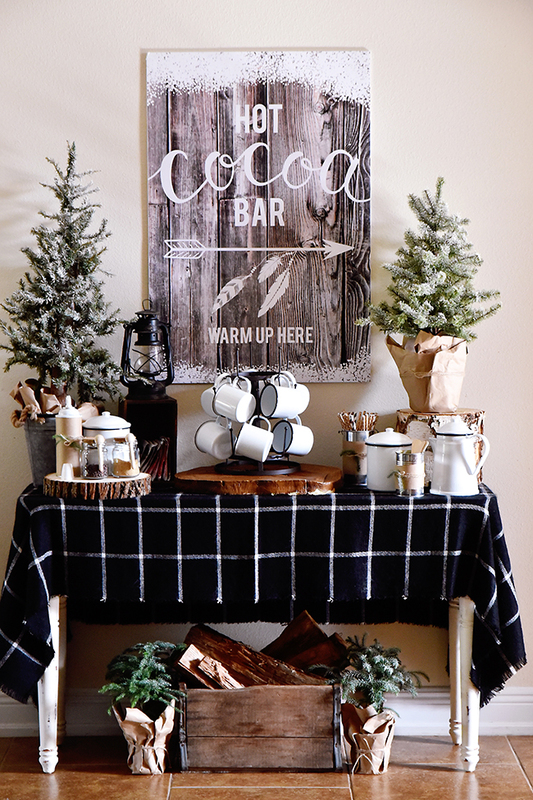 We have really been enjoying and putting to good use the "Cabin in the Woods" themed hot cocoa bar I created this year for my family. 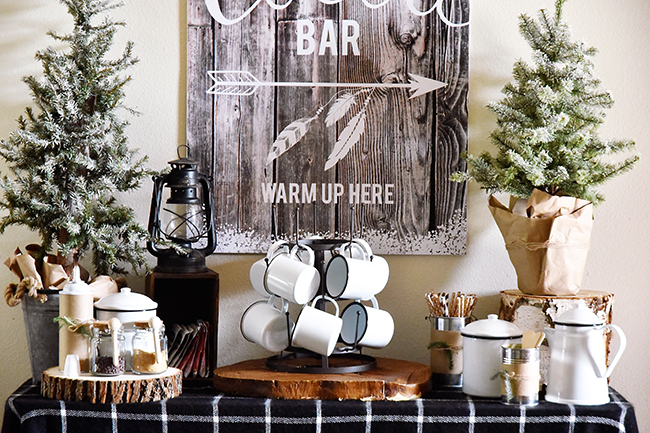 I think the enamelware mugs, pitcher and storage containers mixed with the rustic/woodsy Hot Cocoa Bar sign I designed, along with the other elements really gave it an authentic, earthy vibe. I just love it. 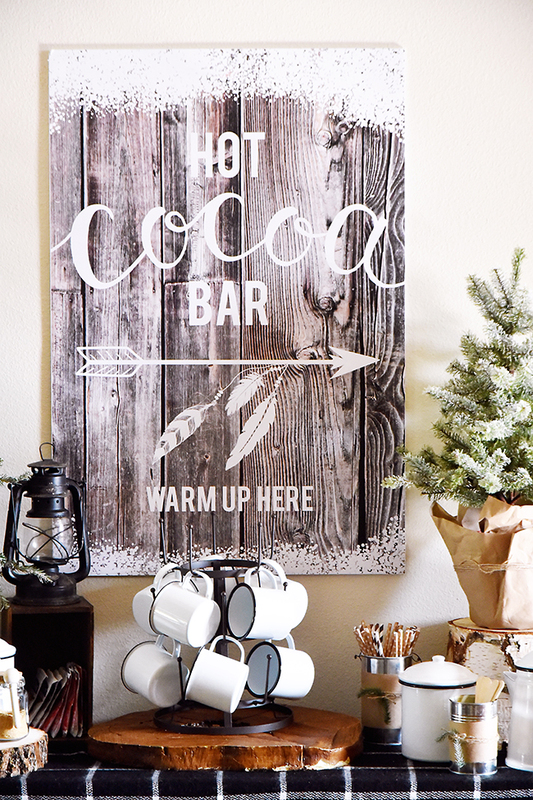 Hot Cocoa Bars are such an easy concept. Seriously. 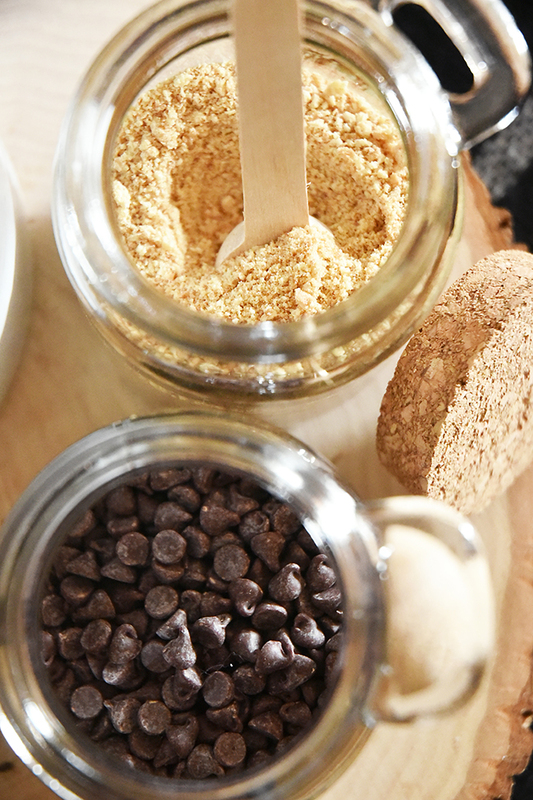 We've been doing these for years and this time I kept it even more simple by skipping the syrups, eliminating a lot of the toppings, using store-bought packets + bulk hot cocoa powder and even eliminating the pirouette cookies we've typically had on the table. 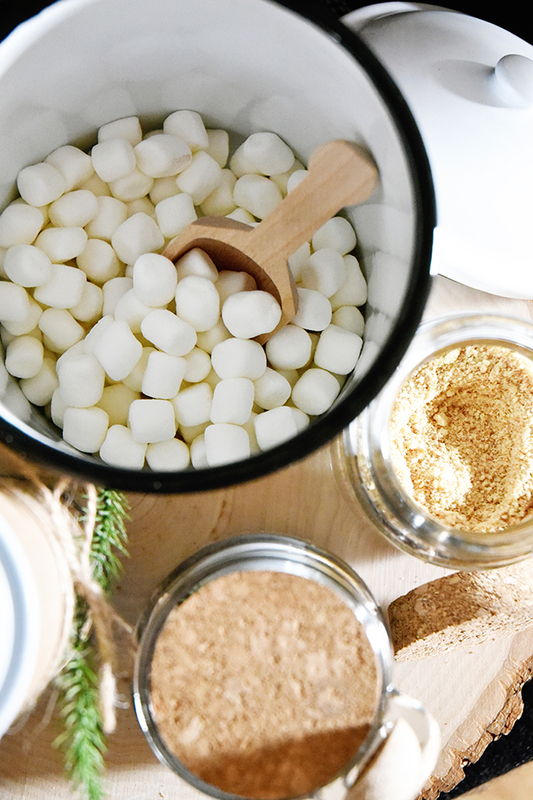 What's been so fun is that I decided to only offer the fixings to be able to create mugs of S'mores Hot Cocoa - to keep with the camp/cabin feel of it all. 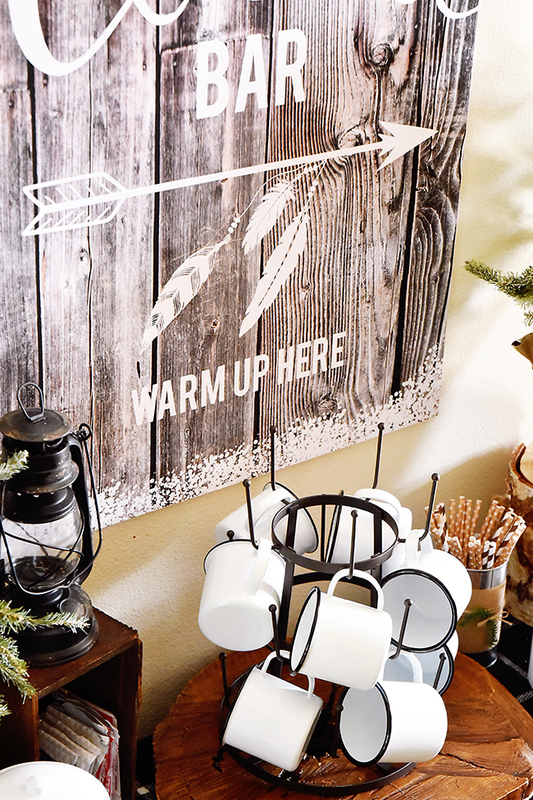 (including the addition of a culinary kitchen torch for roasting the marshmallows on top. We keep it in a drawer near by - for safety). Omgoodness!! These are SO good! 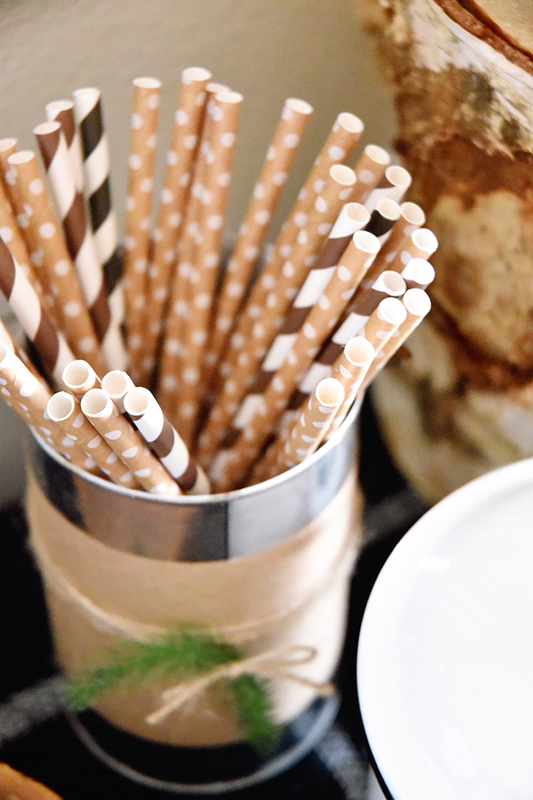 And okay, I miss the cute peppermint stir sticks that usually grace the table, BUT my One Little Word (Less) has really helped me to simplify the set up and it's been wonderful. Our family and friends have thoroughly enjoyed it!! Do you all love it as much as I do? I'm just kidding! I really want to know which one has been your favorite? 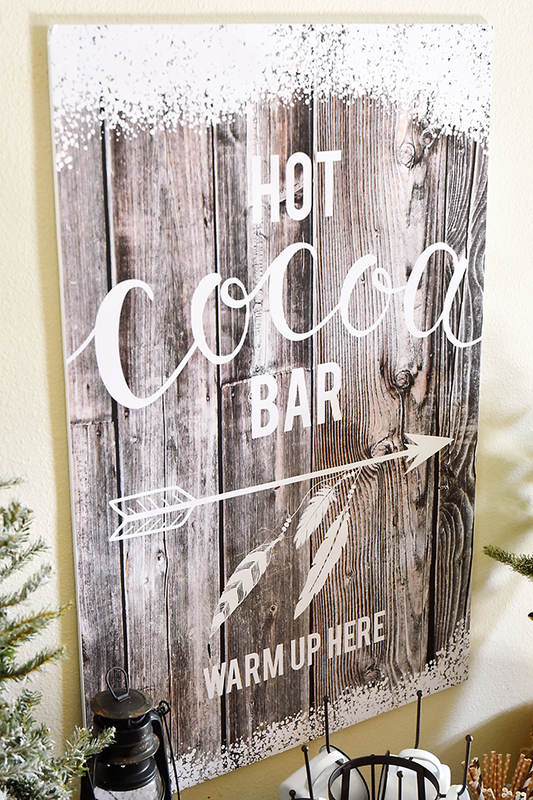 "Baby It's Cold Outside" Hot Cocoa Bar, Hot Chocolate Bar or the new one I'm sharing today!? These, of course, are not necessary. But they sure look cute and the littles think they are fun! 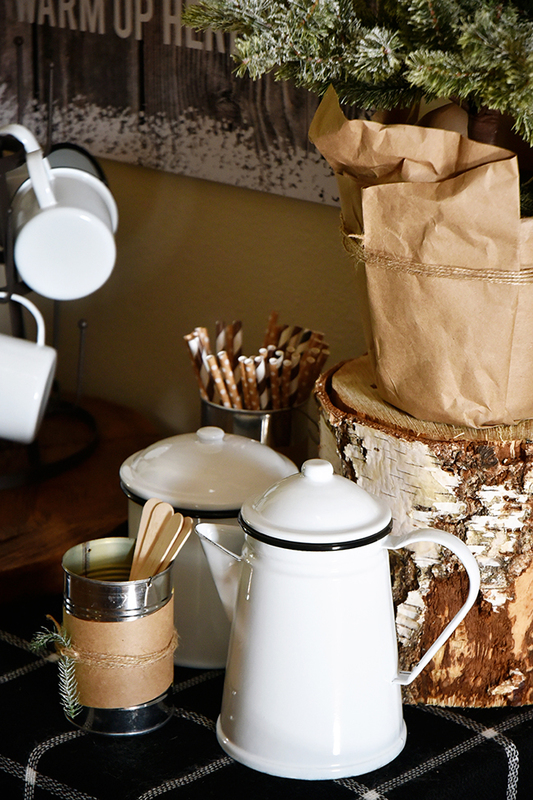 Follow my S'mores Hot Cocoa Recipe for the perfect presentation. 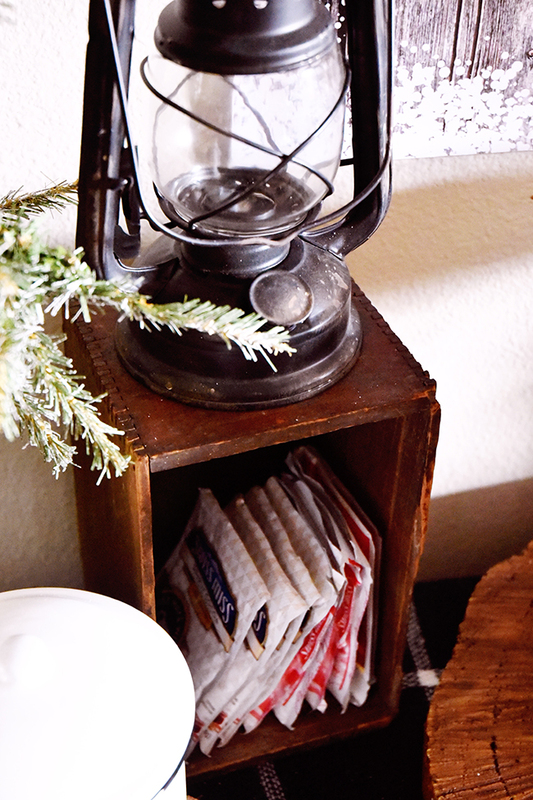 I was originally going to use hot cocoa packets only in order to really keep things simple. 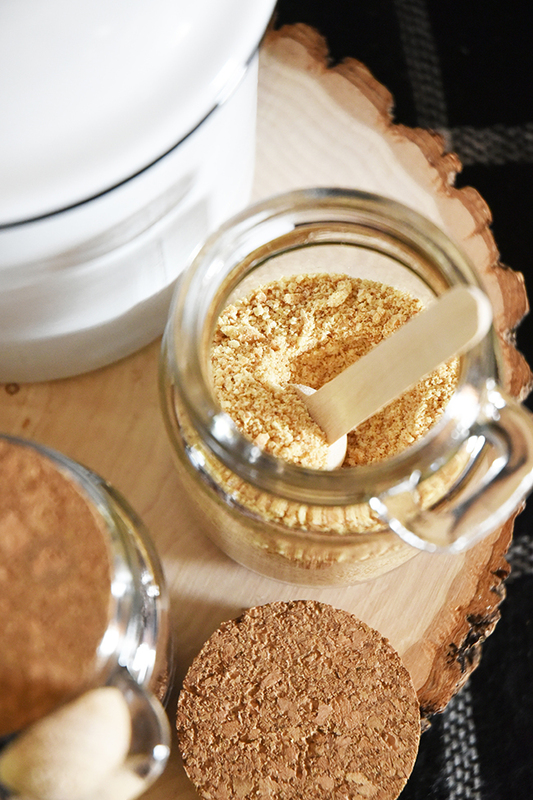 But then found the cute enamelware containers and decided to keep some bulk hot cocoa powder inside one of them. If you use the packets, have a small trashcan near by. 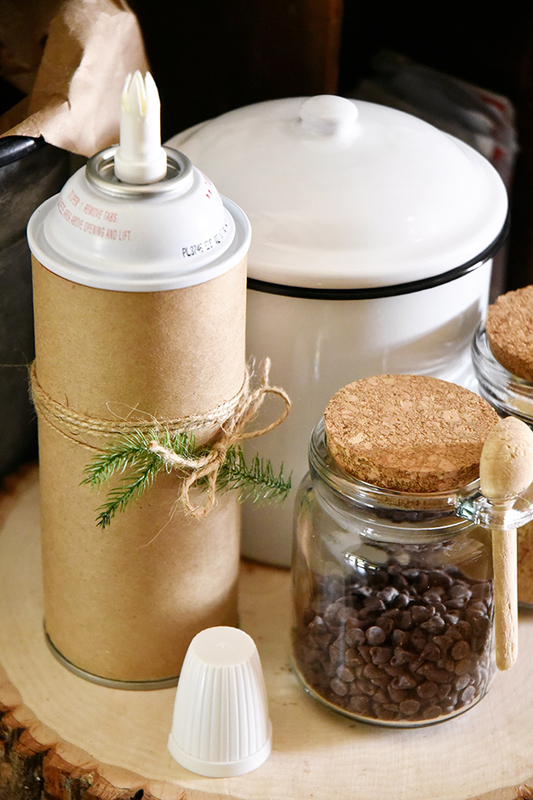 When you purchase your cans of whipped cream, if you intend to wrap the outside of the can with kraft paper, like I did, pay attention to the design of your can. Redi-Whip tends to have a rounded top which makes it more tricky to wrap. Beware! 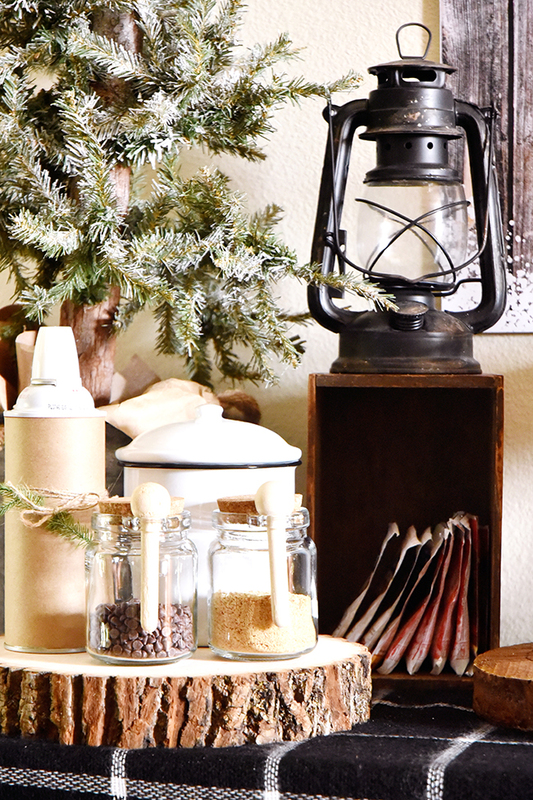 Enamelware mugs are a wonderful conductor of heat; perfect to warm your hands on a cold night sitting by the fire. 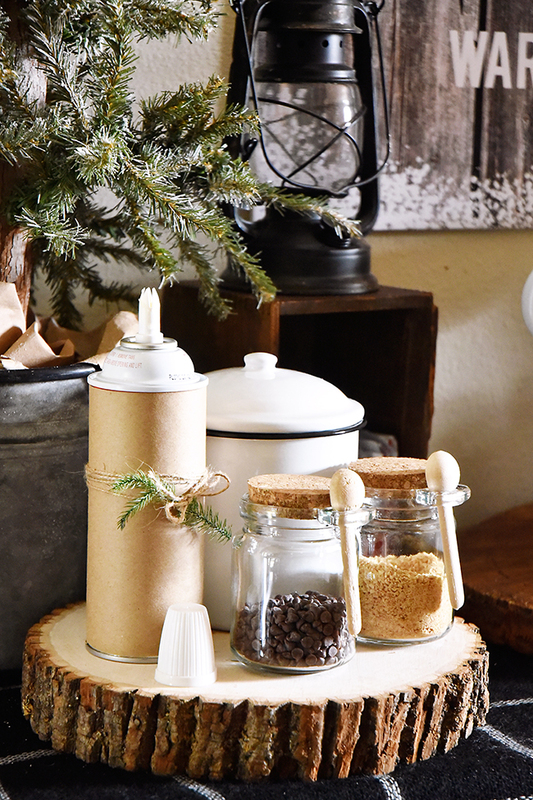 However, when using them in the comfort of your home, be sure to remind your hot cocoa drinkers - especially children, to use the handle on the mugs while sipping. 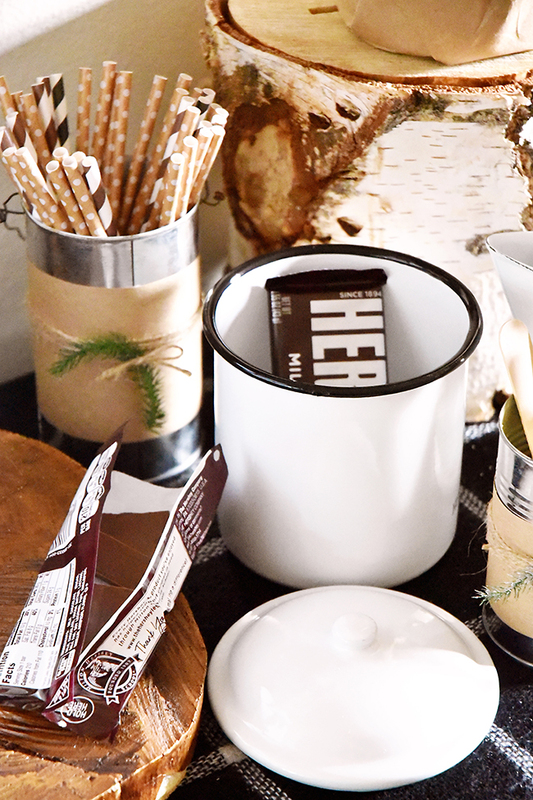 The kitchen torch isn't something I kept on the table but it's SO fun for creating S'mores Hot Cocoa. This was actually one of those Ruana Wraps you wear. It was the perfect size for my small table. Small Fern Trees - I actually picked these up at CVS during the holidays. They had ornaments on them to make them look like Christmas trees. I just pulled those off. I hope you are inspired!! 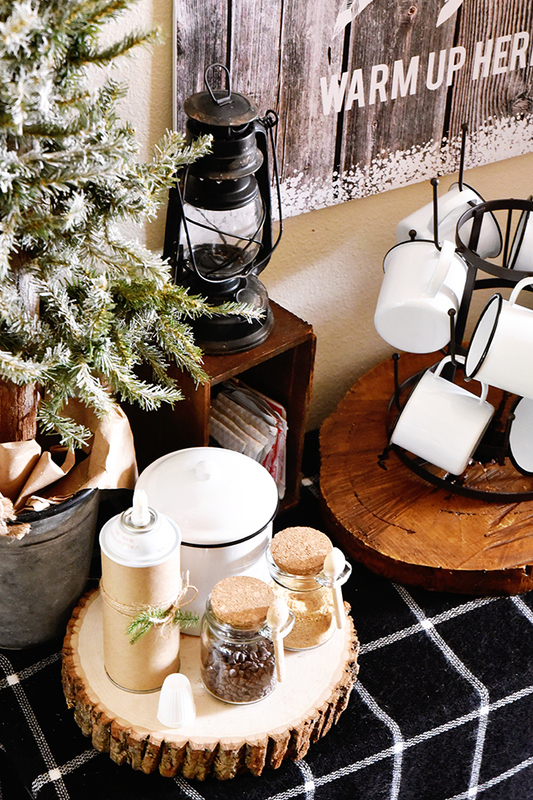 I thought it would be cute to spray all of the green trees with that "snow in a can" to add more charm and authenticity to the table. Honestly though, I don't think it made that much of a difference. Can you even tell I used it? Not really.